Next week I am headed to Vancouver again and you know what? I could not do that if I were doing all these tasks that I shouldn’t be doing. 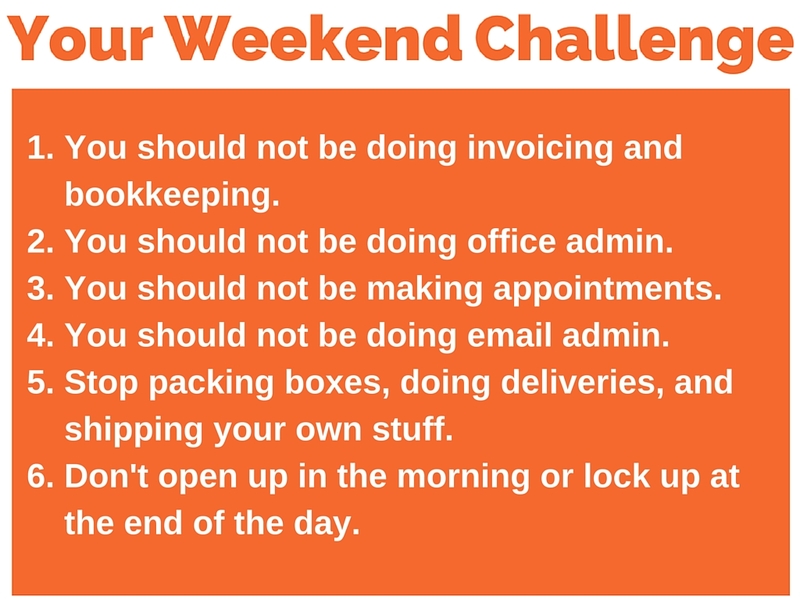 So today’s weekend challenge is going to be all about those pesky tasks that you keep trying to do, but really should be delegated to your team. Now, be sure and grab your pen and paper. 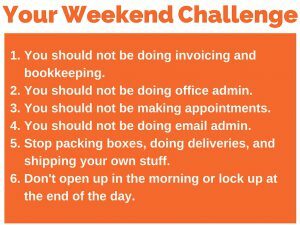 If you need help with more weekend challenges like this one, be sure and visit MarketingforOwners.com/Challenge. 1. 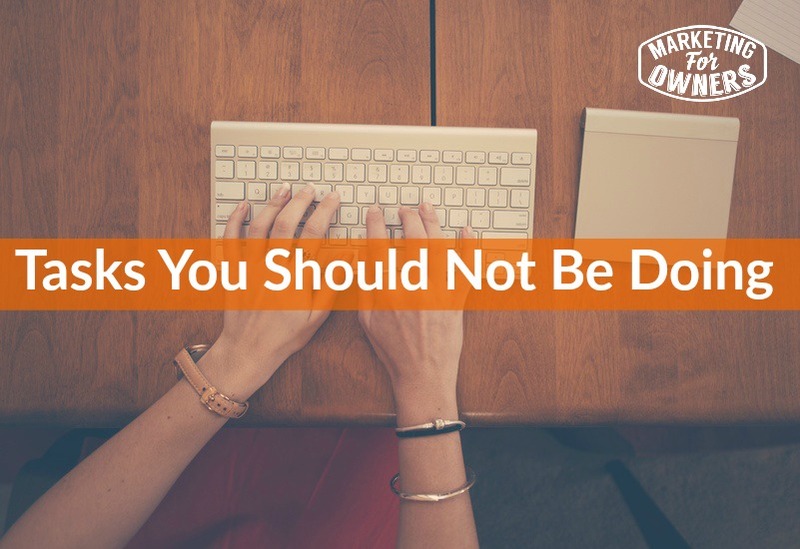 You Should Not Be Doing Bookkeeping and Invoicing. Now, I am not talking about taking notes for your invoicing. If you are the one that quoted the price, you should make the notes, so that your bookkeeper who is a professional, will have the details to invoice the right amount. Your bookkeeper has been trained for this and they know how to do it and do it professionally. If your sales person goes out and makes a sale, no one in the company knows about it until that person gets back to the office and gives it to the accountant, with all the details of the sale. 2. You Should Not Be Doing Office Admin: I know you might be thinking, it won’t take long, but really? It will take longer than you think. It needs to be done all of the time. You cannot get on with out this happening. Who is going to order your stationary, answer your phone, and more? You might be thinking that you cannot afford someone like that, but you an. There are virtual assistants, general assistants, local people who would fit the bill nicely — all kinds of people out there that is suited to do this kind of work. There are services to answer phones and take messages and then forward those to you so you never have to answer the phone. General office admin happens all the time. What will happen is that as your business grows, that admin job will grow with your ob. If you wait until your business has grown, you will be stuck doing all these tasks yourself. Believe me! I’ve been there, done that. 3. You Shouldn’t Be Making Appointments: I am talking about phoning up customers here and setting up times for you to go out and visit them. If your business is in the construction industry, you will need to set up times to go look at work. Don’t be the type of person who just shows up. Hire someone to make those appointments for you. If you are in the sales, you can train someone to help make your calls. You Might think, “Oh I’ll just answer my emails over breakfast.” What does your spouse think about that? What do your kids think about that? Do you think that is healthy? What if you work for someone else? You have to be at work by 9 and then you finish work at 5. You won’t be answering emails, etc once you get home. You need to try and separate family life from your work life. Teach your new hire how to answer emails the way you would. Show them — hey will gradually learn. For the first few days of them working for you, have them tell you how they would answer certain emails. Then you let them know if they got it right or now. Then, have them forward to you the emails that need a personal response. All these things are possible. Your excuses are just getting in the way. 5. Stop Packing Boxes, Doing the Shipping, or Do Deliveries: Do not – I repeat – do not be the type of person who packs or ships or delivers your own boxes – -that is unless it is part of the service, like a farmer or something like that. What I mean, is someone who has a business who sells stuff. Don’t you pack them and put them in your car and take them to the mail to ship them. How about a retired person? They could give you the time you need. An older person who is bored, would love to have this kind of job. They would even deliver them for you while you do your own work. 6. Don’t Open Up and Lock Up at the End of the Day: Now, you might think that this sets a good example. You are the first one at work and the last one to leave. Who told you that this was a great practice? Where did you get that bit of information from? Do you think that you have to show up first? Why? What respect does that get? Don’t! Just allow someone else to be the one to open up. Be sure to have a backup just in case the other person cannot get there to open up. You have an important job so make sure everyone knows. They will hep and they will understand then you will be on the path to a more efficient business. Now, you can spend all that spare time with your family, or working on building your family! Have a great weekend. If you can just mark off one or two of those, your life will be so much better! Trust me. Have a fabulous weekend and I will chat with you on Monday. Which of these 6 will you start on first?